It may look like a small mountain range, but Steens is actually just one massive mountain. When you visit the largest fault block mountain in North America, expect extremes. Snow falls earlier and lingers longer than you might expect in the high country here, so be sure to check road reports before heading out. If you’re hiking here in the mid-summer heat, carry a gallon of water for each day and bring a hat for shade. 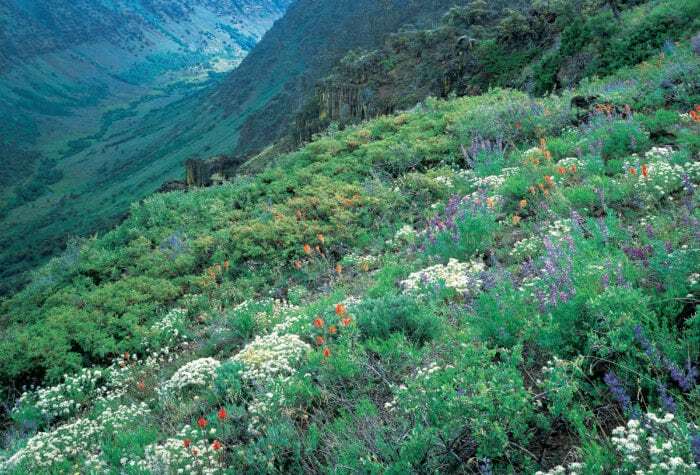 The 52-mile Steens Mountain Backcountry Byway provides easy access to the mountain’s four campgrounds and the Kiger Gorge and East Rim scenic viewpoints. You can expect any other roads—indicated by dashed lines on a map—to be passable by four-wheel drive vehicles only. Primitive camping is allowed on all Bureau of Land Management lands, unless otherwise marked. For a slightly more civilized camping experience, check out one of our favorite campgrounds. Visitors will find 23 campsites among aspen stands and shore willows. Camping, swimming, picnicking, cross-country hiking and fishing in Fish Lake are the most popular activities in the area. Featuring 36 campsites with picnic tables and grills amid juniper and sage, this campground is close to the Historic Riddle Brothers Ranch, hiking trails and Little Blitzen and Big Indian gorges. Recreational stock (horses, mules, llamas, goats, etc.) are not allowed in the family portion of South Steens Campground, but are welcome at 15 equestrian sites complete with tie posts and small corrals. This small campground (six sites), located in aspen trees, offers some of the best fall color viewing on the mountain and is close to the Kiger Gorge Overlook. This resort offers tent spaces, full hook-up RV camping, as well as coin laundry and showers. Wifi is available for overnight guests and Verizon cell coverage works here. Their small store carries a limited amount of personal items and snacks. Learn more at www.steensresort.com or call (541) 493-2415. Thirty-six campsites sit under cottonwood and juniper trees near the Donner und Blitzen Wild and Scenic River at the base of Steens Mountain. A Blitzen River Trail trailhead is located within the campground. A volunteer camp host is generally onsite May through October to share information about the area. Page Springs Campground features concrete picnic tables and fire rings, ADA-approved water lines and faucets and an ADA-accessible restroom. If you’re looking for quaint lodging, you’ll find it at the base of Steens Mountain. This historic hotel and their modern satellite, the Drover’s Inn, offer visitors a comfortable, quiet escape from a hectic world. This resort offers cabins, tent spaces and full hook-up RV camping, as well as showers and coin laundry. Wifi is available for overnight guests and Verizon cell coverage works here. Their small store carries a limited amount of personal items and snacks. Hikers can send themselves resupply packages here with prior arrangement. Dining options in the Steens Mountain area are quite limited, but they are great bets if you time it right. Just be sure to bring plenty of snacks and meals with you, too. Fields, population 14, is the southernmost hamlet in the region and food, fuel, and drinking water are all available. The Fields Cafe serves huge breakfasts and famously thick milkshakes. The Frenchglen Hotel is located 60 miles south of Burns on Highway 205. The hotel serves breakfast, lunch and dinner (by reservation only) in their front dining room. For reservations, call (541) 493-2825 or email fghotel@yahoo.com. Visit the Frenchglen Hotel website for more details. Enjoy bountiful wildflowers and enchanting waterfalls as you follow the Little Blitzen River up a long, glacially-carved canyon. On this hike, you'll travel through verdant meadows and groves of cottonwood and aspen, all while enjoying big wild views. A lovely hike down to a gorgeous lake, then back up to the rim of Steens Mountain. An old mining track carries you up the canyon through a rugged rock narrows with wildflowers and views of the desert playa below. If the desert lakebed is dry, you can hike out onto its cracked, alkali surface for a few miles to experience the remarkably empty playa and to admire Steens Mountain from below. The Alvord Hot Springs, a privately-owned hot spring, bubbles up at 174 degrees, but cools by the time it reaches man-made sitting pools. It’s also worth exploring other geothermal springs in the Alvord Desert (although not for soaking!! ), including Borax Lake, Mickey Hot Springs and Willow Creek Hot Springs. Named for an early rancher, Mann Lake has satisfied anglers seeking cutthroat trout for over 40 years. These trout are supremely well adapted to survive in alkaline desert waters, and, without them, fisheries like Mann Lake could not exist. Recognized for its near pristine condition, 73 miles of the Donner und Blitzen River system are designated as a Wild and Scenic River. It’s also well-known for its catch and release angling opportunities. The river flows northwesterly to the marsh lands of the Malheur National Wildlife Refuge near Frenchglen. Three bachelor brothers, Walter, Frederick and Benjamin Riddle, settled here in the early 1900s and built the Riddle Brothers Ranch by gaining control of water in the area. They secured homesites and raised livestock in and around the ranch. In the late 1950s, the Riddle brothers sold their ranch holding, and, in 1986, the BLM purchased the property. The agency has since managed the ranch for its historic values. For more information, visit the BLM website. ONDA and our partners have worked tirelessly since 2008 to communicate that Steens Mountain is an inappropriate place for industrial-scale energy development.